Achromobacter denitrificans (formerly called Alcaligenes denitrificans) is an aerobic, motile, Gram-negative, nonglucose fermenting, and oxidase and catalase positive bacilli. The organism, first described by Yabucchi in 1971, is found in soil and water and only rarely causes human infections. However, these opportunistic bacteria can cause infections in immunocompromised hosts including those with HIV infection, malignancy, cystic fibrosis, and undergoing prolonged hospitalization. 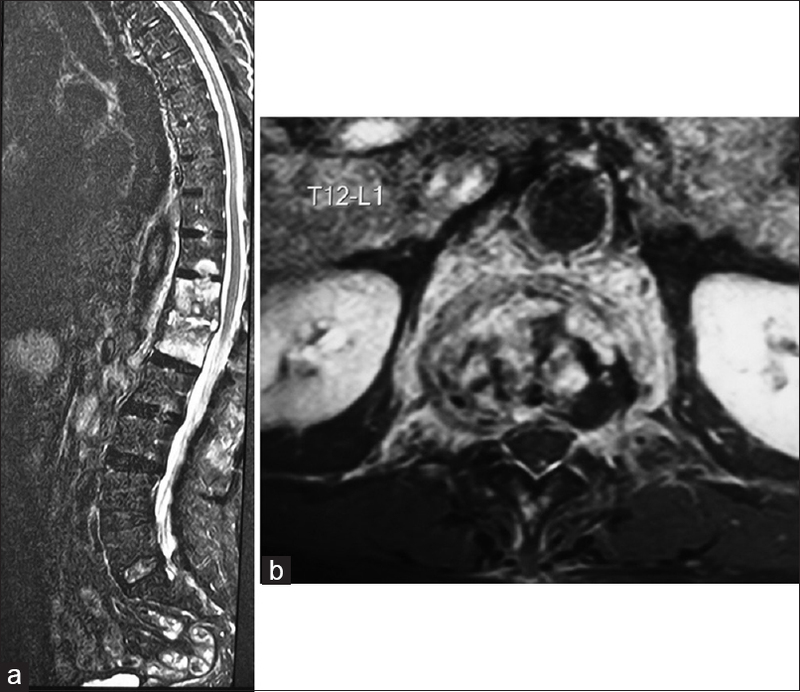 We present a case of A. denitrificans spondylodiscitis in an otherwise healthy 71-year-old male. To the best of our knowledge, this is the first report in English literature. 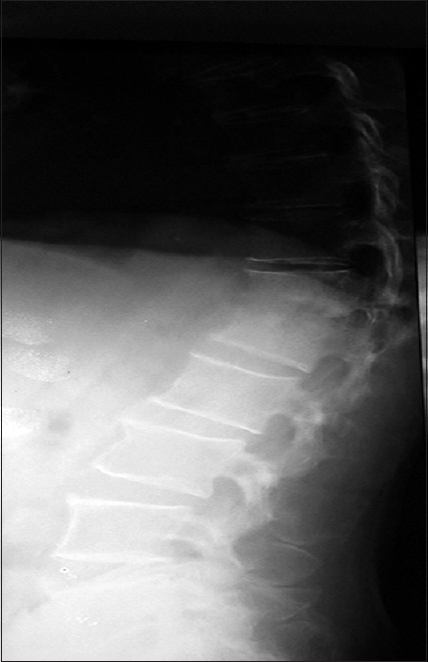 A 71-year-old male presented with mid back pain, loss of appetite, and weight loss of 3 months duration. The pain was constant, aggravated by activity, disturbed his sleep, and was not relieved by simple pain medications. He was neither a diabetic nor did he have any medical illness that could potentially impair his immunity. On examination, an increased thoracic kyphosis (round back) was noted with deep tenderness at the thoracolumbar junction. No swellings or sinuses were present over the back. The movements of the thoracolumbar spine were restricted and painful in all directions. The straight leg raise test did not produce back or leg pain and the lower limb neurology was normal. Radiographs [Figure 1] and magnetic resonance imaging (MRI) scan [Figure 2]a and b] of the thoracolumbar spine revealed the destruction of the adjacent endplates of T12 and L1 vertebrae with fluid (pus) in the intervertebral disc space. The hemoglobin was 11.4 g/dl; differential count showed 66% neutrophils, 30% lymphocytes, 3% eosinophils, and 1% monocytes and the erythrocyte sedimentation rate (ESR) was 88 mm/1 h. A computerized tomography (CT)-guided percutaneous vertebral biopsy performed on two occasions was inconclusive. Four-drug antituberculous therapy (ATT) regimen was commenced, and a thoracolumbar brace was prescribed. At one month followup, although the ESR reduced to 33 mm/1 h, the patient developed difficulty in walking with Grade 4/5 power in the lower limb muscles with normal sensations and absent upper motor neuron signs. A second MRI scan, at this stage, revealed an increase in the volume of fluid (pus) in the epidural space behind the T12-L1 interspace [Figure 3]a and b]. Given the worsening neurological status, posterior pedicle screw stabilization (T9-L4) with T12-L1 laminectomy and curettage of the disc space was performed. The disc space was subsequently filled with local bone graft. Histopathological examination of the tissue removed from the site of infection did not reveal any malignancy or granulomatous infection. A. denitrificans was identified and antibiotic susceptibility ascertained using the VITEK®/2 COMPACT system (bioMerieux, La Balme les Grottes, France). Based on the antibiotic sensitivity report, a combination of intravenous ampicillin + sulbactam (1 g + 500 mg) and oral sulfamethoxazole + trimethoprim (800 mg + 160 mg) was prescribed for 6 weeks followed by oral therapy with both drugs for a further 6 weeks. At the 6-week mark, the lower limb motor power had returned to normal, and the ESR dropped to 29 mm/1 h. The ESR returned to normal at 3 months when the antibiotics were stopped. At the last follow-up (2 years after the surgery), the patient was ambulant with no pain, neurological deficits or restriction of activities and the X-ray showed the healed T12-L1 lesion [Figure 4]a and [Figure 4]b. The genus Achromobacter xylosoxidans, belonging to the Alcaligenaceae family, is a ubiquitous environmental Gram-negative, oxidase-positive, nonglucose-fermenting rod with two subspecies, A. xylosoxidans subsp. xylosoxidans and A. xylosoxidans subsp. denitrificans.A. denitrificans inhabits aquatic sources in the environment and hospitals,, as well as the human gut and may cause nosocomial or community-acquired infections. Nosocomial outbreaks are associated with an aqueous source (usually saline or hemodialysis fluid), incubators, and mechanical ventilators.,, Community-acquired infection is rare, and restricted to immunocompromised patients, especially those with cystic fibrosis,,,,, The 71-year-old immune competent male discussed in this report, regularly visited his farm outside the city from where he could have acquired the infection from an aquatic source (community acquired). A. denitrificans can cause infections ranging from endocarditis, meningitis, pneumonia, peritonitis, conjunctivitis, osteomyelitis, intra-abdominal abscess, and prosthesis infections.,,,,A. xylosoxidans infections are usually polymicrobial and commonly present as a co-infection with coagulase-negative staphylococci (28% incidence). Infected intravenous catheters and bladder catheters are a significant source of bacteremia. Duggan et al. reviewed risk factors, clinical presentation, sequelae, and treatment of 77 patients with A. denitrificans infection. Nearly 70% of these patients had nosocomial bacteremia, of which 36% had an infection associated with an outbreak or an isolated point source, 16% had a community-acquired infection, 13% were neonates or premature infants, and 27% were immunosuppressed. The most common underlying illness was a malignancy and cardiovascular disease. The overall mortality among the 73 reviewed cases was 30% with a high case-fatality rate among neonates (80%) and those with pneumonia (66%) and endocarditis (75%). Nearly 65% of the deaths (15/23) occurred as a result of nosocomial infection, and 60% of these (9/15) were associated with outbreaks. Based on in vitro testing, 91% of the strains were inhibited by piperacillin, 79% were inhibited by ticarcillin-clavulanic acid, 100% were susceptible to imipenem, and 81% of the isolates were susceptible to ceftazidime. However, A. denitrificans subsp. xylosoxidans was not susceptible to expanded-spectrum cephalosporins (except ceftazidime), aminoglycosides (including amikacin) or 4-quinolone derivatives. Trimethoprim-sulfamethoxazole (TMP-SMZ), one of the most reliable antimicrobial agents against this species was not uniformly active with one-third of the isolates being resistant to this drug. Clinical reports have shown good response to a 6-week course of meropenem in infective endocarditis and a 14-day course of cefoperazone sulbactam for an infected pancreatic pseudocyst. Incidentally, the organism causing the pancreatic pseudocyst infection was sensitive to amikacin, gentamicin, cefotaxime, ceftazidime, ciprofloxacin, piperacillin, doxycycline, cefoperazone sulbactam, piperacillin-tazobactam, and meropenem, and resistant to ampicillin, cefazolin, and cefuroxime. An extensive review of 77 patients revealed that most isolates were resistant to aminoglycosides, narrow-spectrum penicillins, and first-and second-generation cephalosporins and were susceptible to extended-spectrum penicillins, third-generation cephalosporins, TMP-SMZ, and imipenem. Eleven of 20 isolates were found to be resistant to ciprofloxacin. 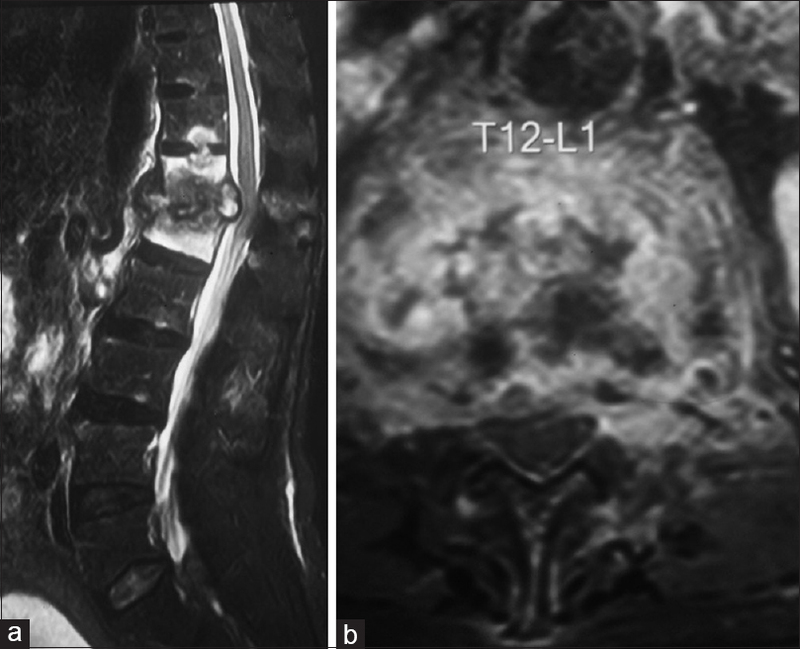 The 71-year-old immunocompetent gentleman discussed in this report presented with back pain and imaging and laboratory test reports suggestive of spondylodiscitis. CT-guided percutaneous vertebral biopsy on two occasions was inconclusive. Given the absence of significant vertebral destruction and nonexistence of neurological deficits, medical management was considered. A four-drug ATT was commenced given the high prevalence of tuberculosis in the country. Although the ESR levels reduced after 1 month of ATT, the patient developed weakness in both lower limbs and inability to walk unassisted. An MRI scan at this stage revealed an increase in the volume of pus/fluid and spinal cord compression [Figure 3]a and [Figure 3]b. 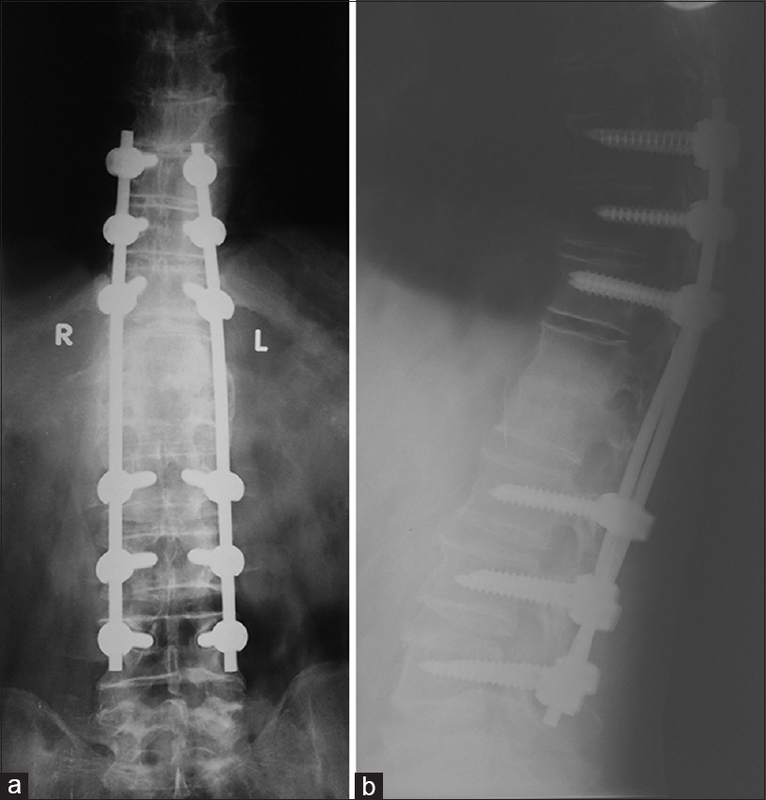 Subsequently, a T9–L4 posterior spinal stabilization (three levels above and below) with a T12-L1 laminectomy, curettage of the involved disc space, and packing with autologous local bone graft was performed. Following surgery, the pain subsided and independent ambulation was possible before discharge from the hospital on the 10th day. A. denitrificans identified on aerobic culture was sensitive to a combination of ampicillin + sulbactam and sulfamethoxazole + trimethoprim. The patient received a 6-week course of intravenous ampicillin + sulbactam (1 g + 500 mg) and oral sulfamethoxazole + trimethoprim (800 mg + 160 mg) followed by oral therapy of both drugs for a further 6 weeks. The inflammatory markers returned to normal at the 3-month mark and at the last follow-up, 2 years after the surgery, the patient was pain-free and functioning normally. The aim of this report is to highlight a rare organism (A. denitrificans) causing spondylodiscitis and discuss the management with specific reference to the antibiotic therapy. The A. denitrificans identified was sensitive to a combination of ampicillin + sulbactam and sulfamethoxazole + trimethoprim. Yabuuchi E, Oyama A. Achromobacter xylosoxidans n. sp. from human ear discharge. Jpn J Microbiol 1971;15:477-81. Weitkamp JH, Tang YW, Haas DW, Midha NK, Crowe JE Jr. Recurrent Achromobacter xylosoxidans bacteremia associated with persistent lymph node infection in a patient with hyper-immunoglobulin M syndrome. Clin Infect Dis 2000;31:1183-7.
van Hal S, Stark D, Marriott D, Harkness J. Achromobacter xylosoxidans subsp. xylosoxidans prosthetic aortic valve infective endocarditis and aortic root abscesses. J Med Microbiol 2008;57:525-7. Eshwara VK, Mukhopadhyay C, Mohan S, Prakash R, Pai G. Two unique presentations of Achromobacter xylosoxidans infections in clinical settings. J Infect Dev Ctries 2011;5:138-41. Glupczynski Y, Hansen W, Freney J, Yourassowsky E.In vitro susceptibility of Alcaligenes denitrificans subsp. xylosoxidans to 24 antimicrobial agents. Antimicrob Agents Chemother 1988;32:276-8. Gómez-Cerezo J, Suárez I, Ríos JJ, Peña P, García de Miguel MJ, de José M, et al. Achromobacter xylosoxidans bacteremia: A 10-year analysis of 54 cases. Eur J Clin Microbiol Infect Dis 2003;22:360-3. Davies JC, Rubin BK. Emerging and unusual gram-negative infections in cystic fibrosis. Semin Respir Crit Care Med 2007;28:312-21. Appelbaum PC, Campbell DB. Pancreatic abscess associated with Achromobacter group Vd biovar 1. J Clin Microbiol 1980;12:282-3. Ahn Y, Kim NH, Shin DH, Park OY, Kim W, Jeong MH, et al. Pacemaker lead endocarditis caused by Achromobacter xylosoxidans. J Korean Med Sci 2004;19:291-3. Teng SO, Ou TY, Hsieh YC, Lee WC, Lin YC, Lee WS, et al. Complicated intra-abdominal infection caused by extended drug-resistant Achromobacter xylosoxidans. J Microbiol Immunol Infect 2009;42:176-80. Lucatelli JF, Cantarelli VV, Picoli SU. Conjunctivitis due to Achromobacter xylosoxidans: Case report. Arq Bras Oftalmol 2009;72:261-3. Lofgren RP, Nelson AE, Crossley KB. Prosthetic valve endocarditis due to Achromobacter xylosoxidans. Am Heart J 1981;101:502. Martino P, Micozzi A, Venditti M, Gentile G, Girmenia C, Raccah R, et al. Catheter-related right-sided endocarditis in bone marrow transplant recipients. Rev Infect Dis 1990;12:250-7.